﻿ Bible Topics: Verses by subject from Torrey's Topical Textbook. The New Topical Textbook is a classic lion of Bible study works, providing a thorough but not overwhelming outline of Bible verses for nearly 700 subjects. 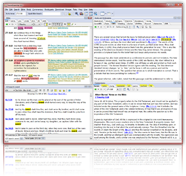 Bible-Topics.com contains the complete topical reference, but improves upon the original work in one significant way: Where the Textbook contained only verse references, this website includes the text of the verses referenced, making it very easy to quickly read what Scripture has to say about a given subject. To find a topic, use the search box at the top of this page or scroll down for an alphabetical index. To do this it is not necessary to read every verse in the Bible from Genesis to Revelation. It would be slow work, if we had to do that on every subject we took up. This would be necessary were it not for Text Books and Concordances. But in these we have the results of the hard work of many minds. Here we have the various passages that bear on any subject brought together and classified for use, so that now we can do in a few hours what would otherwise take months or years. The topical method of Bible study is simplest, most fascinating and yields the largest immediate results. It is not the only method of Bible study, and the one who pursues it exclusively will miss much of the blessing God has for him in Bible study. But it is a very interesting and fruitful method of study. It is Mr. Moody's favorite method. It fills one's mind very full on any subject studied. That is the way to master any subject and to get full of it. Go through the Bible and see what it has to say on this subject. This is easily done. Take your Text Book and turn to the subject. Suppose the subject you desire to study is "Prayer." On Prayer will be found a long list of the various passages of Scripture that bear on this subject. Look them up one after another and study them carefully and see just what their teaching is. When you have gone through them you will know far more about prayer than you ever knew before, and far more than you could learn by reading any books that men have written about prayer, profitable as many of these books are. Sometimes it will be necessary to look up other subjects that are closely related to the one in hand. For example, you wish to study what the teaching of God's Word is regarding the atonement. In this case you will not only look under the head "Atonement" on Atonement, The, but also under the head "Blood" on Blood, and under the head "Death of Christ," on Death of Christ, The. To do this work a concordance is not necessary but it is often very helpful. For example, if you are studying the subject "Prayer" you can look up from the concordance the passages that contain the words "pray," "prayer," "cry," "ask," "call," "supplication," "intercession," etc. But the Text Book will give most of the passages on any subject regardless of what the words used in the passage may be. Be thorough. When you take up a subject do not be content to study a few passages on this subject, but find just as far as possible every passage in the Bible on this subject. If you find the Text Book incomplete make additions of your own to it. Be exact. Find the exact meaning of every passage given in the Text Book on any subject. The way to do this is simple. In the first place note the exact words used. In the next place get the exact meaning of the words used. This is done by finding how the word is used in the Bible. The Bible usage of the word is not always the common use of to-day. For example, the Bible use of the words "sanctification" and "justification" is not the same as the common use. Then notice what goes before and what comes after the verse. This will oftentimes settle the meaning of a verse when it appears doubtful. Finally see if there are any parallel passages. The meaning of many of the most difficult passages in the Bible is made perfectly plain by some other passages that throws light upon them. Then parallel passages are given in the margin of a good reference Bible and still more fully in "The Treasury of Scripture Knowledge," a volume worthy of a place in the library of every Bible student. Arrange the results of your topical study in an orderly way and write them down. One should constantly use pen and paper in Bible study. When one has gone through the Text Book on any subject, he will have a large amount of material, but he will want to get it into usable shape. The various passages given on any topic in the Text Book are classified, but the classification is not always just the one best adapted to our individual use. Take for example the subject "Prayer." The classification of texts in the topic is very suggestive, but a better one for some purposes would be: 1st. Who Can Pray so that God Will Hear? 2nd. To Whom to Pray. 3d. For Whom to Pray. 4th. When to Pray. 5th. Where to Pray. 6th. For What to pray. 7th. How to Pray. 8th. Hindrances to Prayer. 9th. The results of Prayer. The passages given in the Text Book would come under these heads. It is well to make a trial division of the subject before taking up the individual passages given and to arrange each passage as we take it up under the appropriate head. We may have to add to the divisions with which we began as we find new passages. The best classification of passages for any individual is the one he makes for himself, although he will get helpful suggestions from others.